Senator John J. Williams believed that public education should be funded and directed by state and local communities and not the federal government. 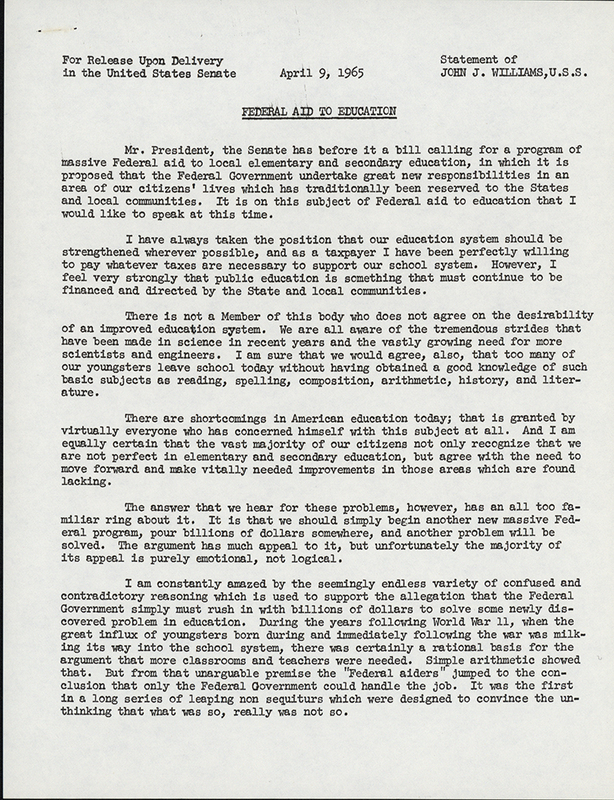 He stated that the bill contained "within it the seeds of the first Federal education system," which would make state governments merely administrative offices of the federal government and bring with it "the flood of Federal control." Williams, John J. (John James), 1904-1989. "Statement from Senator Williams on his stance against the Elementary and Secondary Education Act." Papers of Senator John J. Williams, University of Delaware Library. Accessed 25 April 2019. http://acsc.lib.udel.edu/items/show/37. United States. Elementary and Secondary Education Act of 1965.